Natural Poire William flavouring from the southern Alps, combined with Cognac makes Douce the most exquisite of pear liqueurs. 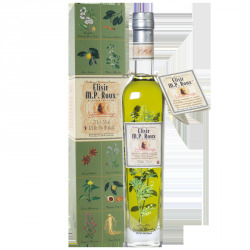 This liqueur, characteristic of Haute Provence, is produced with wild thyme, a rustic and rebellious plant, harvested at the beginning of springtime, a time when our whole region is scented by this "simple"perfume. This characteristic digestif is testament to time-old tradition and regional soils, thanks ti its delightful garrigue perfume! Génépi, gathered when flowering in july among ragged rocks, lends this mountain liqueur its character and finesse. Provence almond with its bitter-sweet taste, combined with fine de Provence and cherry, peach and vanilla infusions lend Amandine its fruity character. Elisir M.P Roux is an absolutely captivating liqueur; a unique mix of plants and spices from all around the world. Its taste reflects its botanical composition, offering the complexity of numerous soft spices and herbs. Vibrant and warm, it distils the essence of marjoram, lemon balm and mint with light notes of aniseed with exquisite finesse. Spirits, also called liqueurs and sometimes digestifs, are created from a base of distilled alcohol, unlike other drinks like cider, wine or beer that are the result of fermentation. They are produced from the distillation and or maceration of botanical products such as fruit, plants, roots or flowers. Certain liqueurs are used for making cocktails, and others are for drinking by themselves. The aim is to reveal the true expression of the fruit or plant from which they are made, for example the Poire de Douce, which is half pear, half cognac. 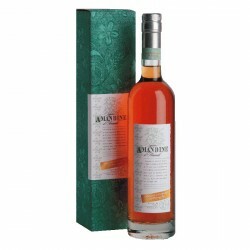 Others are a subtly delicious blend of several fruits, as is the case of Amandine with its almonds, cherries and peaches intermingled with different spices for a unique taste. Liqueurs can very well be consumed neat or on the rocks, and their digestive qualities after a meal have earned them the name of digestifs, but they can equally well be served as an aperitif. They are also excellent flavour enhancers for use in cuisine. Fruit based liqueurs pair well with desserts, ice creams, sorbets and other sweet dishes, whilst more intense liqueurs made with plants such as farigoule (or thyme) are ideal for incorporating into meat or seafood dishes. The Provençal liqueurs proposed on this page also make great cocktails. Pear, chocolate, tropical fruit, almond, thyme, blueberry, genepi…. Take a look at our cocktails section to discover hundreds of original and refreshing cocktail recipes, to make with your favourite liqueurs.